Hi everyone! So I am a couple days late for Five for Friday. We had Friday off from school and I planned on doing this at night but all of sudden in the late afternoon I started feeling super sick and I ended up coming down with what appears to be a really bad head cold. I was out of it yesterday but today am feeling like I can at least put this together even if it means lying down the rest of the afternoon. By the way, last school vacation, I also was really sick at the beginning. Valentine's Day was the last day of school and by the time I got to the restaurant I was not feeling great and by the next morning I was sick as a dog. What it is up with that? Seems so cruel! I mean we don't want to be sick on a school day either, but as soon as vacation starts?! Anyway onto better things. 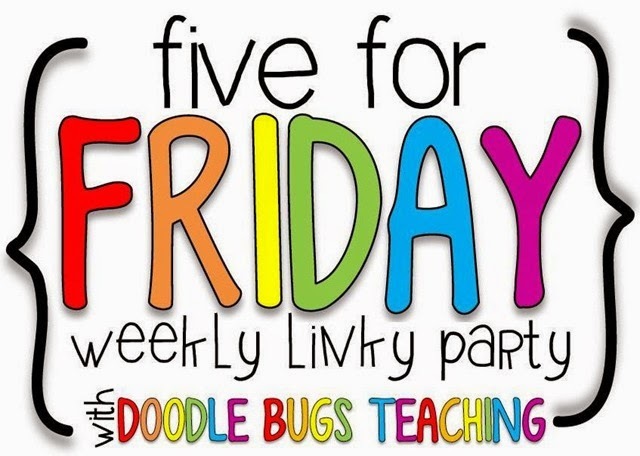 I am linking up with Doodlebugs Teaching for the always fun Five for Friday. Here are my Five for Friday this week! And don't you love the glitter numbers? They are by Glitter Meets Glue Designs - that stuff is fabulous! For Earth Day, I found a lot of activities to connect with the curriculum and things we needed to practice. First was this super cute and fun craftivity which I found here for free. This guy got some decorations on his shirt! These were taken during set up. Love the one of the left-she's so casual "whatever". We also did a lot of activities from What the Teacher Wants' Earth Day Mini Unit which was found here. I am pretty sure these Lorax pages were from it, but I could be wrong. I am a little surprised when folks don't have their name or store name on each page of their product. If you know for sure this is from her mini unit or not, please let me know! Now for some super bizarre reason, the Treasures Reading Program has a Christopher Columbus story at the beginning of unit 5. Hi, it is April! Weird time of year to talk about Columbus! And The Tiny Seed was in the fall - that would make more sense for right now. I think it has to do with the reading level of the selections, but it is still odd to me. In any case, this is a text that is fairly uninspiring to the kids, but I do have quite a few enthusiastic artistics. I let them try this Illustrate It! page which a colleague gave me (but she did not make it and it has no markings on it so we don't know who to give credit to. Look at their amazing illustrations though! This girl was trying to work in one of or vocabulary words, "voyage": "Yay we're taking a voyage". My quest to make the best popovers continue! I got a new popover pan and tried the more expensive King Arthur Flour and this is what I got! Crazy falling over sideways popover! I have never seen anything like it. Even my friend who went to culinary school said, "That is so bizarre"! Tasted great though! 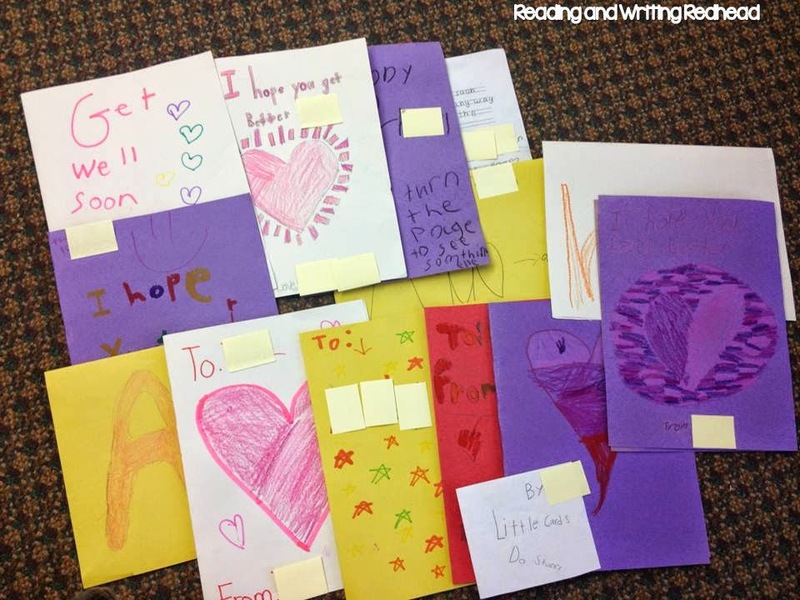 Someone has been out of school for a few weeks and my kiddos took it upon themselves to make all of these cute get well cards! This one boy brought this in from home. There are things on the back too: word search, making words, doodle, fun facts, and on the front he said "A little card can hold big things". So adorable! I bet it took him at least 45 minutes at home. Very thoughtful- not just a get well card but a card with fun things for the patient to do. And it wouldn't be a Five for Friday without a shot of Bailey. Here he is showing how it is fun to lie in uncomfortable looking positions, like with his body only 50% on his bed! So silly! Happy Easter and hope you all had a restful weekend! I bet if I made popovers, something like that would happen to me too! :) Glad they were delicious! LOL Thanks Brandee! Have a good week! Currently April 2014... Hello, Spring?? ?